The Lava Boss works in all versions of the game, including the final release, and is even part of the released codebase. This means that, as long as the right ART tiles are present, he even functions in Redux. What's interesting about the Lava Boss's appearance here in the 1996 beta is that his behavior is completely identical to the final release. In a way, this is not surprising since we can surmise the Lava Boss was dropped very early on judging by his art style, but this does mean his code was left in the game for at least a year without ever being touched or formally removed. That's strange. I remember the Lava Boss just following me in the 97 Beta. Don't remember him attacking. BTW, Nigel just replied, and we should be seeing these up soon. Let's start here, although I've asked about the betas long before then. And Crickets, nothing pursued by Hendricks or TX. Do you see? Do you see how this happened with absolutely no help from Hendricks or TerminX? I've asked more times, I've shortened this image presentation. It`s alittle jumbled but I don`t care to refine it, you get the picture. Thanks TX, Hendricks, 3DRealms and Devolver. Everyone except the 4 or 5 people rammed balls deep in behind of the admins here I would assume. What have you ever done for SW, Myhouse? or are you just a cool guy mouth piece? You know you don't HAVE to retaliate EVERY time. Some might actually get the right impression of you sometimes if you didn't give in. I've got the energy for it. His code is still in the final version of the game. Put any art in his now empty tile slot and it'll follow you around and shoot lava rocks. I remember Lava Boss running around and doing nothing too. Personally, I think the Lava Boss would've been a better BOSS2 than the Giant Sumo because it's more thematically in-line with the Naga. Can someone record a video of the working Lava Boss? Lava Boss aside, were there more enemies in the '96 version that didn't make it to final? Does it still have the dragon? Robman, why do you sound like you are trying to take credit for this release? I'd think you'd be happy that something finally came out. If anything, the kind of behavior you're exhibiting may at worst discourage further releases. What behavior would that be exactly? If anything, the kind of behavior you're exhibiting may at worst discourage further releases. It would be a low excuse for someone with privileged content of interest to the community to claim they were discouraged from releasing because an individual (or even a group of individuals) on the internet aren't acting the way they like. 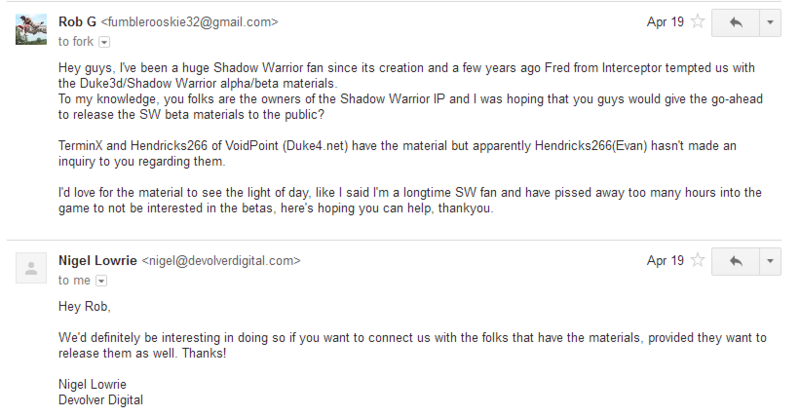 Being a bit pushy towards getting SW betas released, as well as wanting to take credit for it. Sure, you do have the most interest in having wanted these released, but you're but one part of the process that led to the release. At least give the ones entrusted to the beta material prior to release some props as well. 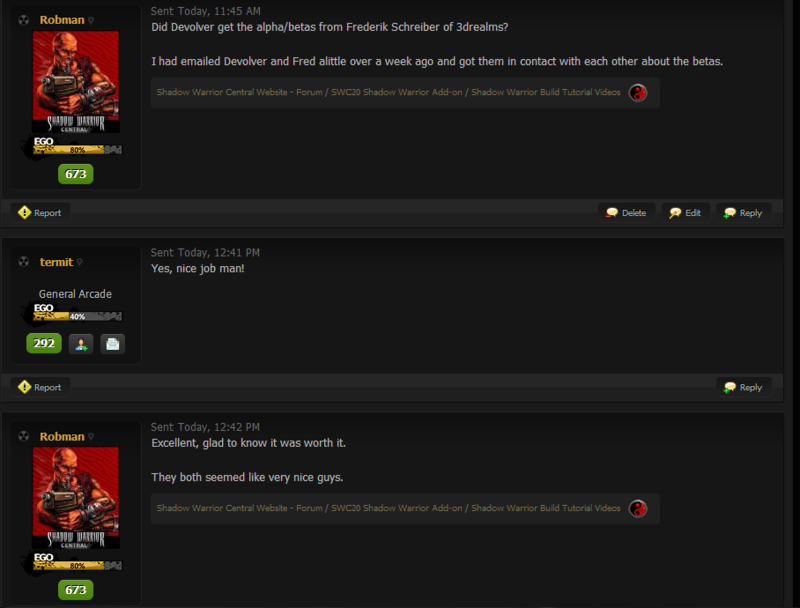 This is true, yes, and in all fairness though, it's unlikely for Devolver to respond this way. I mentioned that because there have been people (or groups/companies) who did respond that way, leaving things people were looking forward to in the dust. Indeed... and you shouldn't accept any version of the excuse that it was the behavior of the community or individuals that was the problem. If it's actually important to them it will get released. If they try that excuse they are using it as a scapegoat to cover for their own time limitations, ego, or ulterior motives. There is a world of difference in the sin of being overly excited about feeling like you've contributed to the improvement of a community you've invested in for a very long time... and punishing a community by holding content of interest hostage just because the social conditions aren't to your liking. 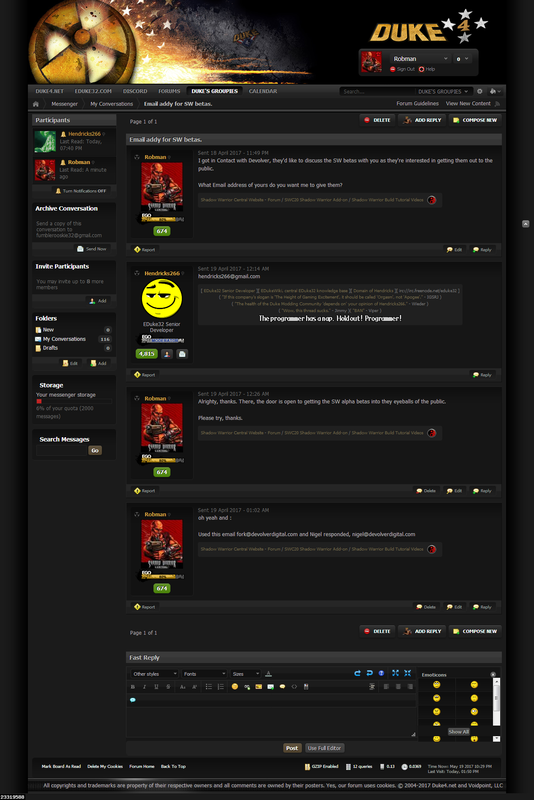 Now I have "Shadow Warrior Classic", "Shadow Warrior DOS" and "Shadow Warrior Original" in my steam folder all at once. Guess which one this is. I wonder if there'll be a community effort to polish and distribute these, hope everything is free to tinker with. Only problem is the lack of a relatively hassle-free SW port, but I'm hopeful this will spark interest in it again. Redux is tied to Steam, so I don't really like it. Huh, I just noticed that in the 1997 Beta, the Duke 3D jetpack is still present if you enter the cheat "SWALL" and then press j. Funny. Nobody here would ever do that. Huh, I just noticed that in the 1996 Beta, the Duke 3D jetpack is still present if you enter the cheat "SWALL" and then press j. Funny. it's in the final version of Shadow Warrior too. With god mode enabled, you can fly by pressing J. How did I never notice that until now? Also if you want to look through all the maps, just run a cmd prompt in the folder and "SW.exe -map "mapname". Anyone found trace of enemies working underwater? I've always thought that it was very limited since only ghosts and fishes really work underwater. Looks like Serious Sam has many similar elements to SW. The lava golem that throws lava balls at you, the enemies that run at you with explosives then blow up. 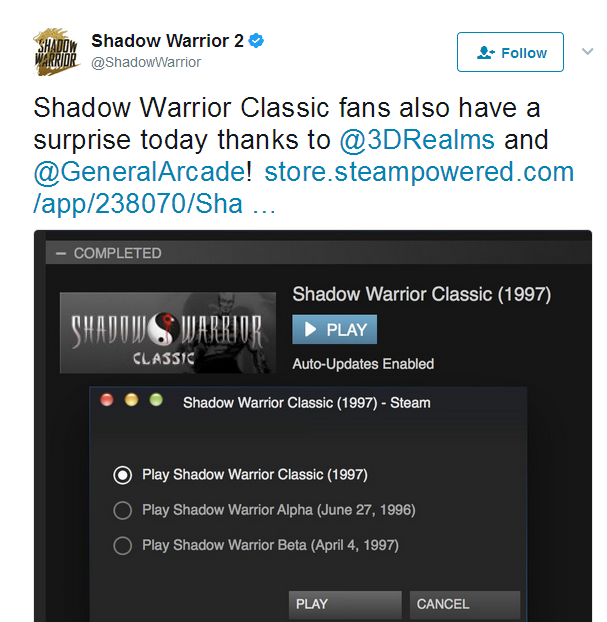 While that's a bit too generic to claim Serious Sam was influenced by Shadow Warrior, they pretty much did have a Shadow Warrior level in Serious Sam 2* which might indicate they actually were. I also just noticed that, if you are gibbed in the 1996 Alpha, then you are able to shoot projectile vomit at enemies... non damaging of course. Which would explain why it's possible to shoot blood splatters around while dead in the retail multiplayer. The Sound FX test still plays the same sounds as in Duke3D's last iteration of SETMAIN.EXE. The highest mixing rate that can be chosen in the program is 22050 Hz as usual. The Music test, claiming to play the "Shadow Warrior Theme Song", really plays a variant of the Apogee Fanfare. I wonder if there are any scrapped levels in the beta versions that would hint at what these were supposed to be? The Gamecenter feature mentions the player character "being biomedically enhanced", something which was already discarded by the time of that article's writing. Perhaps this could be related to these textures apparently showing some kind of experiments with human(oid) subjects? When the party gets into full swing, expect four to six other hosts. These latecomers are still in development. Some haven't even graduated out of their conceptual stage. One thing is certain: these creatures will all owe their existence to the genetic engineering of the mad, mad Kirin. G. B.: The enemies in the game result from being genetically engineered by the main bad guy. That's as deep as the story gets for now. GAMECENTER: Is Kirin the final adversary in the game? He's supernatural, but does he also have magical powers? If so, what kind? What kind of fight can we look forward to in the final battles? G. B.: Again, all the story elements are being worked on now. 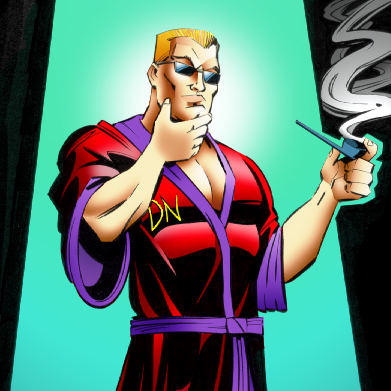 The main bad guy as it stands is not really supernatural. He's more of an evil scientist who can genetically alter things to do his bidding. GAMECENTER: So, the entire story line is still up in the air? Nothing of the former remains other than the fact that the lead character is Japanese? He's no longer part of a special mercenary team, he is no longer related to Kirin, is no longer 1,000 years old...? G. B.: True. The main character is Japanese, will speak in English, and possibly curse in Japanese (with subtitles). Other than that, we will just tweak it all as we go. GAMECENTER: Are there magical creatures in the game? G. B.: This isn't really going to be a fantasy game with spellcasting. You will be able to do some strange things with enemies' body parts, though. And these body parts do have some interesting powers, due to being genetically altered. I cannot find the publication date of this article, but G.B. says they were trying to release a shareware version prior to Christmas '96, meaning that the interview took place before that. It appears that Gamecenter was launched in November 1996. You're a highly trained Ninja who must stop a crazed cult of demon worshipers, who have been waiting for some 1000 years for their mystical leader to return. You'll have throwing stars, a sword, a crossbow and an uzi as weapons, plus you'll be able to learn a variety of powerful and aggressive spells. You'll be up against a legion of trained Ninja of varying ability--some can do practically everything you can, such as swim, climb ladders, duck/strafe, crawl, etc. But the demons might pose the real threat with their uncanny abilities (i.e. cling to walls) and various unexplained abilities. 3 years in the future - A chain of remote Japanese islands. You are a member of a secret Japanese mercenary team, trained in the use of several exotic weapons and in the stealth arts of the ninja. Your body has been augmented with state of the art nano-tech biomedical enhancements. Your senses, strength, agility, and stamina are greatly boosted. You are a lethal weapon. The mage Kirin, your ancient ancestor of 1000 years, has risen from the dead on a remote island, given life once again by forces not understood today. Kirin now has an army of cult followers spread over many small islands to do his bidding. Some were once human... some never were. If they are not stopped, evil will spread across the planet. It is your task to stop the Kirin and his army. When hi-tech meets magic-tech... gibs fly! So this is the one with genetic engineering versus magic, but apparently most of it it already got scrapped by November 1996 in favour of a ninja versus mad scientist plot. Curiously, a later snapshot of the same page showing updates from 17 December 1996 does not have any background story at all. It's still over six months away from the first shareware release. Sadly, the Wayback Machine blocks access to shadowwarrior.com ATM due to robots.txt. So the old plot was like Blood but set in Japan, huh. 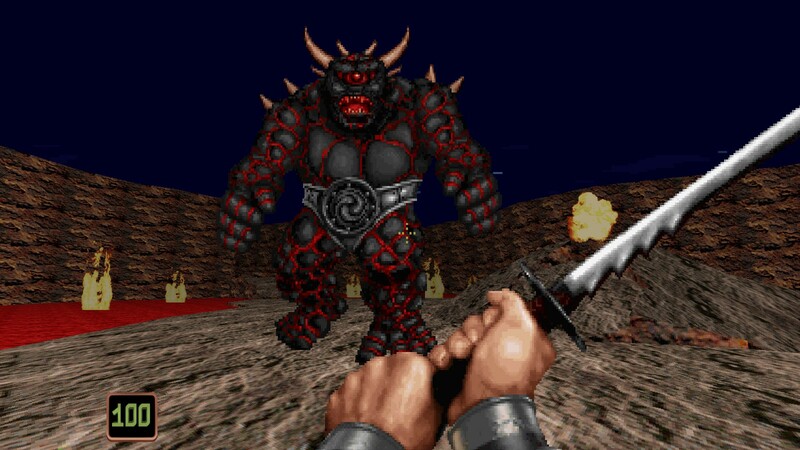 Any mentions of the final boss in the '96 alpha, then? Also, are there any city/urban levels in the '96 alpha too (if there aren't any, then it means the maps still take place on Kirin/Mad Scientist's island?